Keep loose documents right where you need them in this colorful folder featuring images of UF/IFAS and UF/IFAS Extension programs and research. The inside flap is equipped to hold your business card. On the back cover, find a helpful map of UF/IFAS Statewide Facilities! The UF/IFAS Extension Bookstore wanted a new design for the folders that it offers for sale. 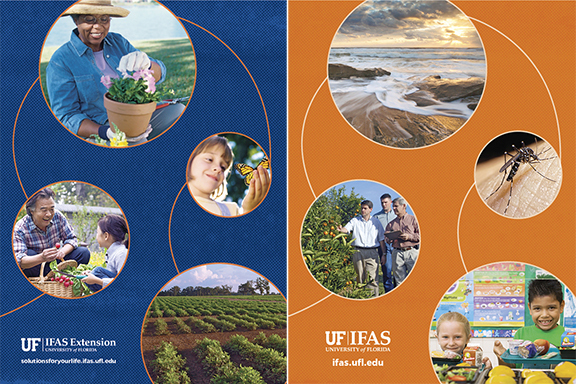 The new folders needed to be a colorful, visually impactful representation of the UF/IFAS brand and its programming. To do this the folders use a series of images representative of our programs and customers. The use of lines and circles indicate that these diverse topics are connected throughout UF/IFAS. Tracy Bryant is the Director of Creative Services with UF/IFAS Communications based in Gainesville, FL.